Move your business to the Internet and start earning more. posters and many, many more! We have created a comprehensive solution for Internet sales, printing-house management, production automation and PDF files. It is the sum of experiences of many years of cooperation with printing and advertising industries. UpMe is the unprecedented effect of synergy of integrated solutions which allows you to develop your printing-house and maximize its profits. Through integrating our systems and integration with external software UpMe enables unprecedented benefits resulting from synergy. All UpMe products are based on the cloud so that access to the Internet is sufficient to have all the necessary information needed to manage your business at hand. Standalone version is also available. UpMe is available in multiple languages and fully supports sales in multiple currencies. An integrated management system for processes in your modern printing-house! UpMe MIS is primarily a tool to support effective operational management. The system covers processes from client acquisition (CRM), bidding and procurement, production, reports. an innovative e-commerce system for your printing-house! UpMe web-to-print solution is dedicated to selling products of a sheetfed printing-house (digital, offset), and large-format printing-houses and manufacturers of exhibition systems. Move your business to the Internet and start earning more. A revolutionary e-commerce system to sell decorative prints — wall murals (wallpapers), images, stickers, posters and many, many more! It is a complete solution for your clients – data bank of 30 million images, ability to design independently, visualization of rooms and printing in your printing-house, which will transform the interior of any home, apartment or office! We created a comprehensive online solution to automate and standardize the file work flow and dedicated to offset printing, digital and large format. 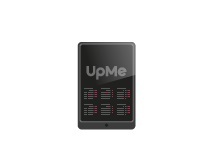 UpMe PDF Automation Engine is more than Preflight, you additionally get a tool to normalize files and most commonly used PDF corrections. We created mobile applications available on for iOS and Android platforms which constitute your mobile command center. It is an application that allows you to perform the most common tasks related to the operation of the system among manufacturing and logistics workers, e.g. settlement of working time or registering stock levels. From now on it is possible even from the phone. All current key information about the enterprise such as, among others, sales, production is all on a single screen with the possibility of personalization and data mining. 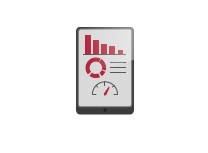 Our application allows simultaneous analysis of data from several systems on one screen. UpMe Dashboard also enables offline analysis of data, eg. on the go. 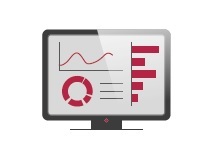 Create your own dashboards containing compensated information and show them on the big TV screen in the sales department or in production.